Paulist Fr. Ryan Casey is the associate pastor of St. Paul the Apostle Catholic Community in Los Angeles. A native of Rockford, IL, Fr. Ryan is the son of Terry and Sheri Casey. He earned his bachelor’s degree in sociology from Augustana College in Rock Island, IL. He entered our novitiate on August 27, 2011, and made his first promises to the Paulist community on July 28, 2012. He made his final promises on September 1, 2017. On September 2, 2017, he was ordained a transitional deacon by Bishop Barry Knestout in the crypt church of the Basilica of the National Shrine of the Immaculate Conception. During his seminary years, he served in the Rite of Christian Initiation for Adults (R.C.I.A.) ministry at a parish in the Washington-area. He was ordained a priest on Saturday, May 19, 2018, at our mother church, the Church of St. Paul the Apostle in New York City. "I was born and raised Catholic and was involved in youth ministry in high school where I first thought about exploring the priesthood. After high school, I decided to explore my faith life by experiencing other religions and Christian denominations. These paths eventually lead me back to the Catholic Church. When I became involved again with my local parish, the call to the priesthood became apparent in my life again. "I first heard about the Paulists through the Busted Halo radio show on Sirius XM satellite radio and the Busted Halo website. What I found there was a community of priests who want to show that the teachings of Jesus and the Church are relevant to our lives today." What he enjoyed most about being a theology student: "Learning more about myself and the Paulists. I also loved being in the classroom and engaging in discussions about Jesus’ life, scripture and priestly mission." Interviewed before his May 18, 2018, ordination, then-Deacon Ryan shared the story of his life and his vocation. 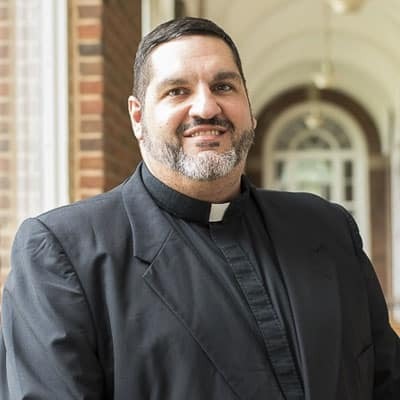 As his ordination approached, then-Deacon Ryan talked with Jennifer Szweda Jordan about everything from binge-watching Christian movies like "Holy Man Undercover" to his occasional street preaching. On Sept. 2, 2017, he was ordained a transitional deacon. The Mass took place in the Crypt Church of the Basilica of the National Shrine of the Immaculate Conception in Washington, D.C., on the campus of The Catholic University of America.